Does this photo of Shanghai remind you of sideshow alley? For me, it's the bright lights. It really is a spectacular city of enormous contrasts. Have you been to Shanghai? What did you think? Did Flash Gordon come to mind??? 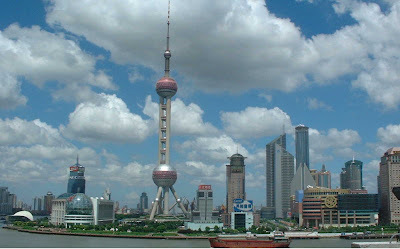 The closest I have ever been to Shanghai is the fact that my new leather sofa was made there! Belinda, the first photo of Shanghai looks like Times Square in NYC. My parents who visited Shanghai recently said it reminded them of NYC. Ming - it is indeed reminiscent of Times Square. BRIGHT LIGHTS!! BRIGHT LIGHTS! !